Paul F. Tompkins is a jack of all trades. He's a comedian, voice actor, podcast character and extremely snappy dresser. He's also had it up to HERE with guys being idiots about women's rights. He is, in one word, awesome. If you don't think you know Paul F. Tompkins, you would be incorrect. He's one of those actors who does everything and seems to somehow be in everything. He's Frank Doyle on the Beyond Belief segment on the Thrilling Adventure Hour podcast. He's done voices for Bob's Burgers and Regular Show. He's a frequent performer on @Midnight and Comedy Bang Bang. He does stand up, he does podcasts, he even has a show on up and coming TV network Fusion called No, You Shut Up! As far as I'm concerned, he is a national treasure. He looks like a dandy, acts like a badass. That was never more true than this past weekend when Thompkins went toe to toe on Twitter against a troll who had issues with the idea of the Bechdel test. 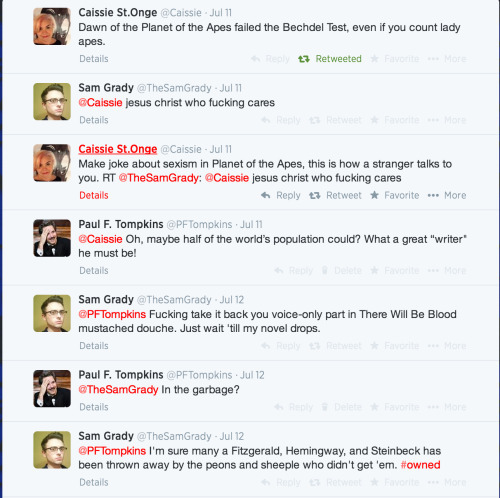 A woman lamented that not even Planet of the Apes can pass the test (not even the female apes talk to each other!) and some bottom feeder from the darker holes of Twitter demanded to know why anyone should care. 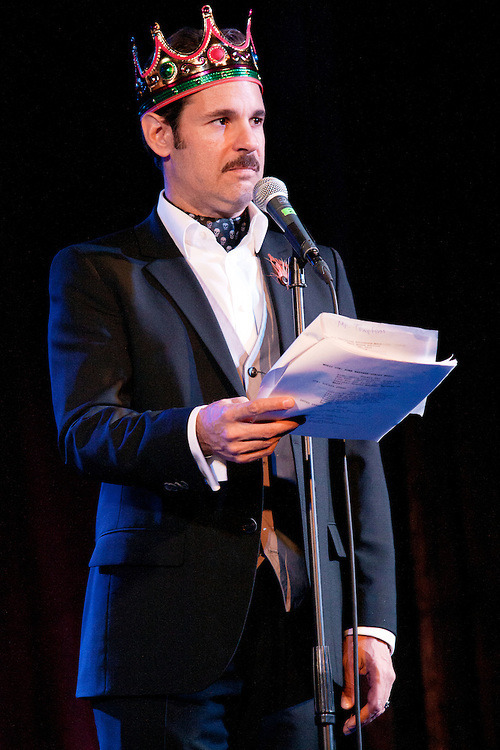 Paul F. Tompkins stuck his impressive mustache into the conversation and gold was created. 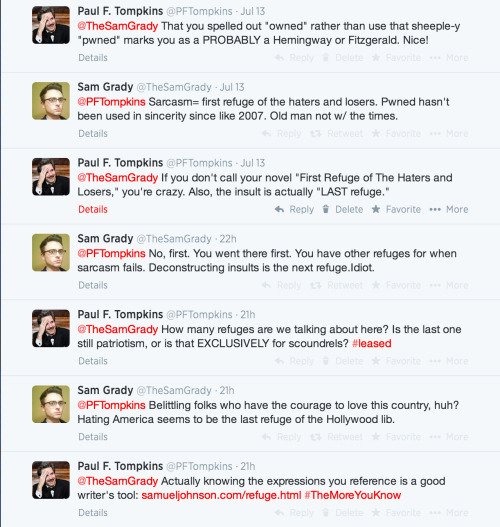 Between the usual internet slap-fight insults, Tompkins drops many a truth bomb. It turns out the troll was just a Twitter user screwing around and pretending to be a Men's Right Activist but that doesn't negate how awesome the back and forth between them was. HEY YOUNG MEN! I know it seems like women complain a lot about how they are represented in media, including fiction, and how it seems like they want entertainment tailored specifically to them, and how they seem to want ALL of pop culture to be politically correct or feminist-ized or whatever it is you think they want, but really, what’s happening is that women are tired of seeing garbage women characters in most of our entertainment. And they’re wondering, Would it really be so much trouble to make more realized female characters? You could still have all your CGI and action and science fiction and drama and swords and stuff, but the female characters could be a little more fleshed out and interesting. And the entertainment would still be good and would, in fact, be better. Boom. Paul F. Tompkins: Modern Day Folk Hero.